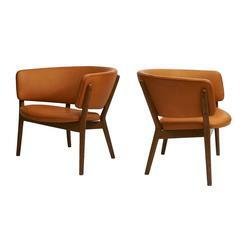 Nanna Ditzel lounge chair in teak and leather. Nanna Ditzel was the most versatile and creative female designer that Denmark produced in the 20th century. Ditzel brought her talents to bear on a staggering array of forms — she designed furniture, jewelry, tableware and textiles; and she shaped her pieces using an equally astonishing variety of materials, from wood and wicker to silver, ceramics and fiberglass. Born in Copenhagen, she trained as a cabinetmaker at the Royal Academy's furniture school — overseen by the great craftsman of the day, Kaare Klint — and graduated in 1943. Ditzel’s early work adhered to the classic Danish modernist tenets of simplicity, comfort and quality, and her armchairs, with their softly curved backrests are much in the spirit of Hans Wegner. Ditzel’s signature piece of that time is her “Ring chair.” Designed along with her husband, Jørgen Ditzel, a fabric maker, the chair has a semicircular padded armrest that seems to embrace the sitter. Ditzel began designing in wicker and in 1959 produced the “Hanging chair.” The piece, suspended from the ceiling by a chain, became a favorite for fashion shoots and may be as iconic of the 1960s as Eero Aarnio’s plastic ball chair of 1963. In 1956, Ditzel began designing for the Danish silverware firm Georg Jensen. In an association that lasted some 40 years, Ditzel would create organically shaped jewelry, barware, ceramic tableware and even tablecloths. Like her fellow Dane Verner Panton, Ditzel was not afraid to embrace industrial materials, and she began designing fiberglass chairs in the mid-1960s. Some of her most flamboyant work came toward the end of her career, in pieces such as 1989’s “Bench for Two,” with its shocking Op-art finish, or the “Trinidad chair” of 1992, with it’s sunburst-like, cut-though backs. Such feats of creativity were a fitting coda to one of the most imaginative, prolific and remarkable women of modern design. 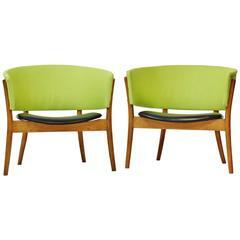 Nanna Ditzel "Oda" lounge chair with teak armrests and legs. A nicely patinated leather strap 'Laura' lounge chair designed by Ross Littell for ICF. A nicely patinated pair of leather lounge chairs designed by Martin Visser for t Spectrum. Walnut "New" lounge chair by George Nakashima, 1959. Sold with copy of original order card. 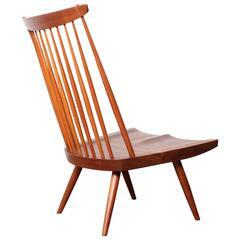 Nanna Ditzel design oak lounge chair for Knud Willadsen, Denmark, 1952. 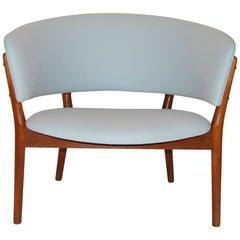 Nanna Ditzel lounge chair designed in 1952 and produced by Knud Willadsen. 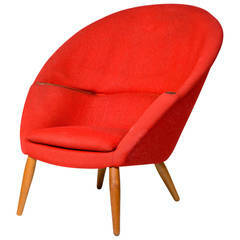 Nanna Ditzel AP-26 lounge chair designed in 1953 and produced by A P Stolen. 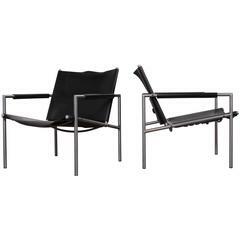 Nanna Ditzel model AP 26 lounge chairs made by AP Stolen, Denmark. Newly upholstered with oak legs, very comfy. 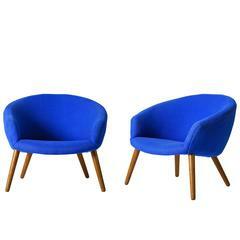 Rare easy chairs designed by Nanna Ditzel. Solid beech frame with organic lines. Cali style upholstery with wool backrest and premium quality black leather seat.